Glippie the rooster sings on the roof of his house, adding to the music of the yard a steady, quiet trill. 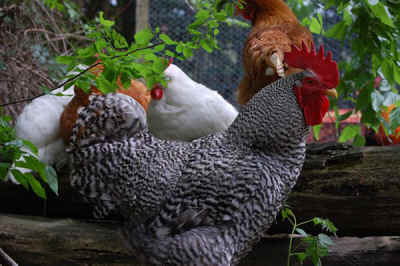 Living with chickens has made me realize how tuneful and talkative these fascinating birds are. The language of chickens is an essential part of their personalities and of their highly developed social life. Chickens start talking even before they are born. About 24 hours before a chick is ready to hatch, she starts peeping to notify her mother and siblings that she is ready to emerge from her shell. This activity, which biologists call “clicking”, helps to synchronize the hatching of the baby chicks. A communication network is established, both among the chicks and between the chicks and their mother, who must stay calm and unruffled for as long as two days while all the peeping, sawing, and breaking of eggs goes on underneath her. Since some of the chicks may have aborted in the shell during incubation, the peeps inform her how long she needs to continue sitting on the nest. As soon as all the eggs are hatched, the hungry mother and her brood go forth eagerly to eat, drink, scratch and explore. The chicks venture away from their mother, communicating back and forth all the while by peeps and clucks. The hen keeps track of her little ones by counting the peeps of each chick and noting the emotional tones of their voices. When a chick becomes separated from her mother, she gives a distress call, and the mother hen dashes out to find her and, if the chick is in danger, to deliver her – hopefully – from the hole in the ground, tangled foliage, or threatening predator. When a hen is ready to lay an egg, she gives a pre-laying, or nesting, call, inviting her mate to join her in finding a nest site. Together, the hen and rooster find and create a nest by pulling and flinging around themselves twigs, feathers, hay, leaves and loose dirt, after they have scraped a depression with their beaks and feet. But first comes the search. When the rooster finds a place he likes (under a log, perhaps), he settles into it and rocks from side to side, while turning in a slow circle and uttering primeval grumbling growls which may or may not convince the hen that this is the place. She may accept it, or they may look for another site. 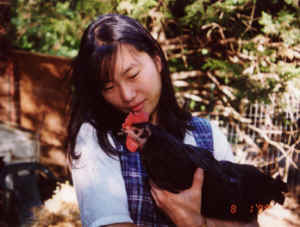 Throughout the search, the hen squawks gently with her beak open, followed by a series of short squawks of diminishing intensity, to keep the rooster coming back to her while she is away from the protection of the flock. To human ears, the egg cackle resembles the chicken’s cry of alarm, but to the birds there is a clear difference. A hen with chicks will continue feeding during the egg call, but will dart for cover when the alarm call goes out. Often I have heard one of our hens call out to her rooster partner: “I’m all alone. Get over here!” Our normally quiet hen, Petal, raises a ruckus if her adored Jules is out of her sight for long, even if she has not just laid an egg. Her otherwise demure little voice becomes SQUAWK, SQUAWK, SQUAWK. Jules lifts his head up, straightens up, mutters to himself, and does an about-face. Off he goes to comfort Petal. Silence. Why do roosters crow? Remember that chickens are originally from the jungle. Their wild relatives have lived in tropical forests for tens of thousands of years. 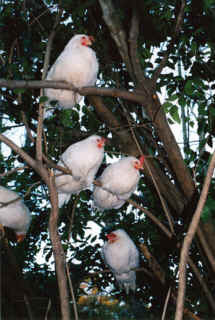 Perched in the trees, and sensitive to infrared light, roosters see morning light at least 45 minutes before we do. They also have very keen ears, a distinct advantage when living amid dense foliage. It can be difficult to see a predator and keep track of one’s flock when the sub-flocks are constantly moving from place to place while feeding. Through their crowing, every rooster can recognize the crow of at least 30 other roosters, probably more. As the protectors of the flock, roosters are always on the lookout. 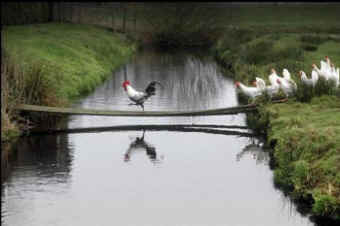 If a rooster spots danger, he sends up a shrill cry. The other roosters echo the cry. Thereupon, the whole flock will often start up a loud, incessant, drumbeating chorus with all members facing the direction of the first alarm, or scattering for cover in the opposite direction. When it looks safe again, an “all clear?” query goes out from the rooster, first one, followed by the others, in their various new places. Eventually, the “all clear” is sent up by the bird who first raised the alarm, and a series of locator crowing sounds confirms where every other rooster and his sub-flock are at this point. The finding of food elicits another kind of vocal communication within the flock. Roosters love to find food and call their hens to the feast while they play deferential host at the banquet. The speed and intensity of the “here’s food” song varies according to the type of delicacy and the amount. According to a biologist, “Two or three kernels of corn elicit about half the intensity and speed between song peaks that several bugs will be granted. When the hens hear this song they and the chicks come running to check out what the rooster has found to eat.” Soon the good news is excitedly clucked to everybody to come join the party. Hens call their chicks to food in a similar clucking voice. In addition to their other vocal language, chickens have a piping voice of woe and dreariness whenever they are bored or at a loose end. Occasionally, one of our hens has to be kept indoors for a while, perhaps because she is recovering from an illness or because she is a newly rescued hen who has not yet joined the flock outside. Wearily, she will wander about the rooms, fretting, or tag disconsolately and beseechingly behind me, yawning and moaning like a soul in the last stages of ennui. As boisterous as chickens often are in the resurgent dramas of their daily life, there is a stillness in them which includes singing, often at the end of a busy day as they settle down on their perches for the night.